Waste Bin Capacity: 7 gal. A Fellowes Powershred 70S Strip-Cut Shredder is perfect for your home or small office. Featuring a safety lock for added protection, the 70S shreds nearly 15 sheets of paper at once, with additional capabilities to destroy CDs/DVDs, credit cards, paper clips, and staples. Each unit comes with a 7-gallon, pull-out bin for easy shred waste disposal. The 70S is classified at security level P-2. Product number 4671001. Dimensions (HxWxD): 20.25" x 15" x 11.25"
This is another great product from fellowes. Im not real wild about the 2 peice trash bin but the shredder is fantastic! It's huge, powerful and can do shredding of paper with staples, etc. I can get through a one inch stack of paper in no time. This shredded is much better than the previous two light weight shredders we use to have. I purchased this 12 years ago for my home office. I have used it a lot over the years with no problems at all. I thank you for being one of the few companies that are making a quality product that holds up and lasts. Welcome to MyBinding video. Let's have a look at the PowerShred 70S, a strip-cut paper shredder by Fellowes. The Fellowes PowerShred 70S is a great desk side shredder. Simple controls right on top, a forward and reverse, and it works office quiet and shreds 11 feet per minute. A small see-through window on the front of the bucket allows you to see how full your capacity is getting. You can handle paper, cardstock, transparencies, CDs, DVDs, credit cards, paper clips, and staples. It seemed whatever we threw at the 70S went away just fine. It has a shred capacity 14 sheets of 20-pound paper. The shred head sits on a stand with a 5-gallon bucket that's located inside. Simply pulled out from the front, you can empty your bucket. There it is, that's the Fellowes PowerShred 70S Strip-Cut Paper Shredder. For more demos, reviews, and how-to's, check out MyBinding.com. 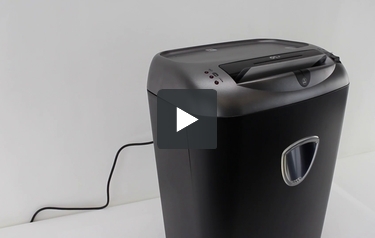 Personal-sized paper shredders are great for use both in the office and at home. One personal shredder that deserves your consideration is the Fellowes PowerShred PS-70. Here's what's great about this device, as well as what isn't so great. The PS-70 is perfect for junk mail, correspondence, old bills, canceled checks, and more. It has a 9-inch feed opening that's large enough for both letter- and legal-sized paper that measures 8.5 x 11” and 8.5” x 14” respectively. This is a shredder is strong enough to take care of several types of non-paper items. These include document fasteners (i.e. paper clips, staples), CD's and DVD's, and credit cards. Because of this, you'll be able to use the shredder to get rid of just about anything containing your personal information. The PS-70 is a strip-cut device that can turn an item into strips that are 7/32” wide. This is a pretty good shred size for a personal shredder, so you can rest easy knowing your information is safe. It has a Level 2 security rating. This machine has a 7-gallon wastebasket which should be more big enough for a large amount of shreds, especially if you don't shred on a regular basis. It's easy to pull the bin out to dispose of your shreds. If you leave the cabinet door ajar, the machine will alert you so you can replace the bin and then close the door. The PS-70 will start shredding as soon as you place something in the feed opening. It can run continuously for up to 12 minutes before it needs to cool down. This device has the ability to shred up to 11 feet of paper per minute. When you use this device, you can shred up to 14 sheets of paper at once. There's an overfeed indicator that will let you know if you're shredding more than the recommended amount. Then you'll be able to remove some paper so you don't jam the machine. If a jam does happen, you can use the reverse mode to clear it up. Finally, the cutting mechanism has a five-year warranty. The rest of the machine is covered for one year. The primary weakness of the PS-70 is that, after you run it continuously for 12 minutes, it needs 20 minutes to cool off. It's disappointing that the rest time is longer than the running time. The PS-70 only has an interlock switch for a safety feature. It lacks Fellowes' SafeSense technology, so be careful when using it. Overall, the Fellowes PowerShred PS-70 is a great choice if you need a personal-sized paper shredder that doesn't have an overly high security rating. It does have a couple of weaknesses, but they're overshadowed by what's great about this device. Take a look at the PS-70 today to see if it's right for you. Throat Width 9" 8.7" 9" 9" 9"
Unit Dimensions (H x W x D) 20.25" x 15" x 11.25" 22.25" x 13.8" x 10.25" 21.25" x 15.5" x 11.3" 20" x 10" x 18.14" 18.75" x 13.75" x 10.44"